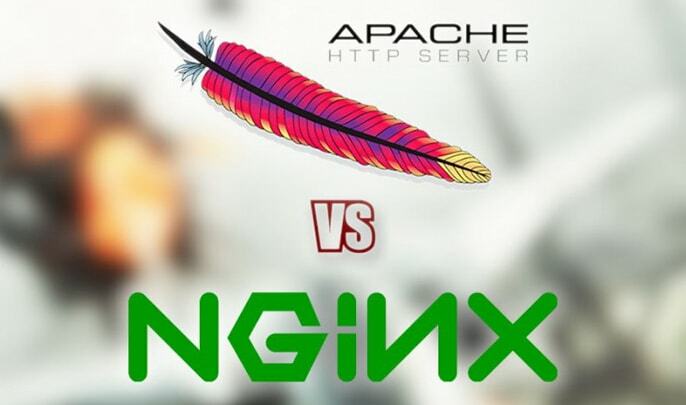 TL; DR: We assess two of the most popular web servers: NGINX and Apache, on six key points of comparison (performance for static vs. dynamic content, OS support, security, flexibility, documentation, and support). We’ll find that the two are worthy competitors, but Apache’s .htaccess file makes it particularly appealing to shared hosting customers. Meanwhile, NGINX reigns supreme for dynamic content support, and due in part to its more advanced feature offerings, is most popularly used by VPS and dedicated hosting users. Finally, we’ll go over our recommendations for hosting your next web app project. There was a time (~late 90s-2011) when the Apache web server served around 60 percent — and at times even more — of the world’s websites. That percentage has since fallen below 35 and is still dropping at quite a significant rate. Meanwhile, Microsoft’s IIS web server has held a somewhat steady, slightly increasing, share of the market, reaching 30 percent today. Third place is held by a competitor called NGINX (pronounced “engine-x”), which currently serves around 16 percent of all sites, and that rate is steadily growing by about one percent each year. I’ll note that some web surveyors place the market shares of Apache and NGINX much higher, considering IIS a lesser competitor. Reality likely resides somewhere in the middle, but the overall trends are clear. Considering only the busiest sites on the Web, Apache holds about 46 percent of the market share, but that portion drops by about four percent annually; NGINX holds a strong second place with 24 percent of the market share and is growing at a rate of about three percent each year. Clearly NGINX is enticing the world’s biggest web properties with something! First, let’s make sure we’re all familiar with the web servers we’re comparing… Or you can skip to our summary review of Apache and NGINX, which includes our hosting recommendations. process model: This is the original “pre-fork” method; it does not scale well with many concurrent connections, as it consumes a lot of RAM and might even refuse connections at high loads. Smaller sites won’t notice this, but larger sites likely will. worker model: This creates a single control process that is responsible for launching child processes. Each child process then creates a fixed number of threads, as well as a listener thread. The listener thread listens for connections and passes them to a thread for processing when they arrive. Though this model scales much better than the pre-fork method, it can still run into scaling issues for very high-traffic sites, due to the single control process bottleneck. event model: This is similar to the worker model, but it creates one listener thread which listens for connections and passes them to a worker thread for processing. This MPM handles long-running connections much more efficiently on a single thread (KeepAlive handling). Since Apache 2.4, the event model has been deemed stable and is now also the default setting if the operating system can support it. You can also try compile-time and run-time options for improving Apache performance. NGINX’s event-driven architecture helps predict RAM and CPU usage, as well as latency, for high/fluctuating loads. Now let’s compare both web servers in several fields. We’ll find that Apache and NGINX are worthy competitors, but depending on your use case, one may be better suited for your project than the other. Don’t worry, I’ll sum it up nicely in my concluding NGINX/Apache comparison. Below we’ll contrast the performance of Apache (using the event MPM) with that of NGINX in both static and dynamic content serving roles. NGINX is about 2.5 times faster than Apache based on the results of a benchmark test running up to 1,000 concurrent connections. Another benchmark running with 512 concurrent connections, showed that NGINX is about two times faster and consumed a bit less memory (4%). Clearly, NGINX serves static content much faster than Apache. If you need to serve a lot of static content at high concurrency levels, NGINX can be a real help. A 2015 benchmark comparing dynamic content serving by Apache and NGINX found that the Apache event MPM, when paired with the PHP-FPM module, can handle about the same concurrency as can NGINX with PHP. Another web server performance comparison showed similar results. The reason for this is almost all of the request processing time is spent in the PHP runtime environment rather than the core part of the web server. The PHP runtime environment is pretty similar between both web servers. Speedemy’s web server benchmarking found similar results using both Apache and NGINX to serve dynamic content. In terms of PHP (and likely other languages as well), the dynamic page server performance is practically equal with a proper Apache module setup (PHP-FPM + FastCGI). If you really want to speed up dynamic pages, you have several options: add a Varnish or Memcached caching layer, switch to a faster PHP runtime (e.g., HHVM), do load balancing, or add more hardware. Unfortunately, the superior static page serving performance of NGINX does not translate to the serving of dynamic pages. Both web servers score about the same on this point. Apache runs on all kinds of Unix-like systems (e.g., Linux or BSD) and has full support for Microsoft Windows. NGINX also runs on several modern Unix-like systems and has some support for Windows, but its Windows performance is not as strong as that of other platforms. Apache comes out somewhat stronger here. Both projects have an excellent security track record for their C-based code base. The NGINX code base, however, is significantly smaller by several orders of magnitude, so that is definitely a big plus from a forward-thinking security perspective. There is vulnerability reporting available for Apache 2.2 and 2.4. NGINX also has a list of recent security advisories. Apache offers configuration tips for DDoS attack handling, as well as the mod_evasive module for responding to HTTP DoS, DDoS, or brute force attacks. You can also find helpful resources for dealing with DDoS threats on the NGINX blog. Customizations to the web server can be done through writing modules. Apache has had dynamic module loading for the longest time, so all Apache modules support this. This is, however, not the case for NGINX. In the beginning of 2016, NGINX got support for dynamic module loading; previously, NGINX required the admin to compile the modules into the NGINX binary. Most modules do not yet support dynamic loading, but over time they probably will. Apache clearly leads on this point. Both Apache and NGINX have a large and growing set of specific feature modules. Unfortunately, a well-maintained list of all third-party modules does not seem to exist yet. NGINX and Apache both have rich and ever-growing feature sets, but the best use cases vary for each web server. It’s not easy to say if Apache or NGINX has a clear advantage here, but most of the core needed module functionality (e.g., proxy-ing, caching, load-balancing, etc.) is available for both web servers. NGINX looks stronger in the area of acting as a reverse proxy for TCP and email (SMTP, IMAP, POP3) connections. In the area of media streaming modules, the commercial NGINX Plus version also looks stronger. NGINX does not support something like the Apache’s .htaccess file. Using .htaccess files, one can override system-wide settings on a per directory basis; however, for optimal performance, these .htaccess directives should be included in the main configuration file(s) whenever possible. This is not possible in the case of shared hosting environments, but it can add a lot of flexibility for shared hosting users. The documentation for both Apache and NGINX are excellent, including the NGINX wiki. NGINX also offers online and on-location training sessions on a variety of NGINX topics — including exam certifications. Apache community support is done through mailing lists, IRC, and Stack Overflow. Commercial Apache support is available from a number of third-party companies, such as OpenLogic, but no official list is maintained by the Apache Foundation. NGINX has community support through mailing lists, IRC, Stack Overflow, and a forum. The company behind NGINX offers a commercial product called NGINX Plus, which has support for a set of extra features regarding load-balancing, media streaming, and monitoring. Shared hosting users might prefer the convenience of the Apache .htaccess file, and Apache better supports loading various dynamic modules, a feature that NGINX only recently added. NGINX is mainly used for VPS hosting, dedicated hosting, or cluster containers. High-traffic website ownerss that need to serve a lot of static content and/or media streams will probably prefer NGINX (or use a combination of Apache and NGINX). In most other website use cases, either web server will do the job just fine. To get started with either web server, you’ll need a solid Linux hosting provider. Luckily, our team compared the best providers and can point you in the right direction for Linux hosting for shared or virtual servers. Well, there you have it. If you still have questions before you select NGINX or Apache for your next web project, be sure to let us know below!